Go-Ahead's Wright Gemini bodied Volvo B9TL, 11904 (ex GT104), is seen operating Route 75 to Dún Laoghaire on the 24th March 2019. The Square would have been a regular haunt for this bus in its Ringsend days, though obviously not on the 75. Given this is the first photo of a 119xx vehicle on the site, it is important to note that 11xxx means double-deck, 119xx means a 9-litre double deck (i.e. GT class bus). Double deckers in the 115xx series are therefore 5-litre (click on photo for larger version). With the takeover of Routes 18 and 76/A by Go-Ahead, the transition phase of routes to Go-Ahead has been completed. It is important to reflect on this notable period of bus operation in Dublin. Firstly, there was a new operator on PSO (Public Service Obligation) routes, but also because the fleet of buses serving Dublin's PSO contracts has increased by 10% in only 6 months. The Dublin Bus fleet has remained pretty static over the period at just over 1000 vehicles. With 10% of the duties being subsumed by Go-Ahead operations, there have been quite a significant number of service improvements. SG161 is seen on the Ballymun Road operation Route 4 to Monkstown Avenue on the 24th March 2019. Route 4 is one of a number of routes that have seen significant increases in frequency since Go-Ahead began acquiring orbital routes (click on photo for larger version). Route 1 (21st October 2018): Morning service from Santry. Daytime from every 20mins to every 15mins. Late evenings from every 30mins to every 20mins. On Satudays, services start 1hr earlier and late evening from every 30mins to every 20mins. On Sundays, services start 1hr earlier. Route 4 (2nd December 2018): Earlier services, daytime frequency from 15mins to 12mins, late evenings from 30mins to every 20mins. On Saturdays, 30mins frequency improved to 15mins daytime, 20mins late evenings. On Sundays, frequency improved from every 60mins to every 15mins. Route 11 (20th January 2019): Principally more running time to improve reliability. Route 13 (24th March 2019): Late evenings from 30mins to 20mins Monday-Sunday. Route 14 (7th October 2018): Became solely a Donnybrook operated route. Significant frequency increases. Morning peak increased from 15min to 10min, daytime increased from 20min to 15min. On Saturdays, early morning from 30min frequency to every 15min frequency, daytime from 20min frequency to 15mins frequency, and evening from every 40mins to every 20mins. On Sundays, early mornings and late evening service from 40mins to every 30mins, daytime from 30mins to every 20mins. 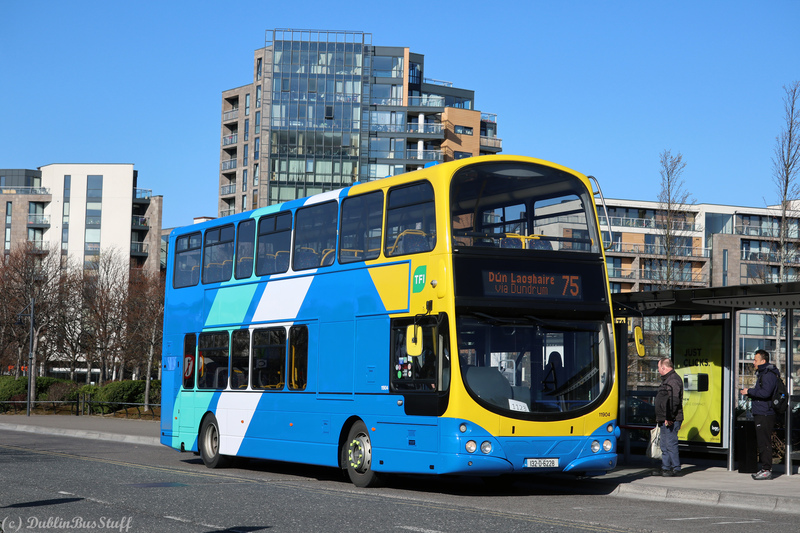 Route 15 (21st October 2018): Donnybrook took over Ringsend's duties on Route 15 except for some morning universals. Services start 1hr earlier at 5am and late evening frequency improved from 20mins to 15mins. Liekwise, late evening frequency on Saturdays was improved from every 20mins to every 15mins. Sunday service improved from 20mins to 15mins. Route 15A/B/D (21st October 2018:) Route 15B starts 30mins earlier, daytime frequency improves from every 20mins to every 15mins and late evening improves from every 30mins to every 20mins Monday-Saturday. On Sundays, Route 15B improved from 30mins to every 20mins. Route 16/D (2nd December 2018): Earlier start times, morning services from Dublin Airport (no services from Santry any more). New Route 16D for buses from Dublin Airport not via Shantalla Road. Late evening from every 20mins to 15mins Monday-Saturday. On Sundays frequency improved from 20mins to every 15mins. Route 25A/B (24th March 2019): Combined Saturday frequency of every 15mins improved to every 10mins. Route 26 (20th January 2019): Route extended to Liffey Valley Shopping Centre. Sunday frequency improved from 120mins to 60mins. Route 27 (21st October 2018): Route 27 afternoon frequency improved from 15mins to 10mins. Late evening services improved from 30mins to 20mins. On Satudays, from every 20mins to 10mins daytime, late evenings 30mins to every 20mins. On Sundays, from 20mins to 15mins, late evening from 30mins to every 20mins. Route 33/E (2nd December 2018): New timetable integrated with 33A operated by Go-Ahead to give 30mins frequency in Skerries/Rush/Lusk. New Route 33E signifies the morning service via Portrane. Route 38/A/B/D (: Combined late-evening frequency from every 20mins to every 15mins.Saturday frequency of 20mins improved to 15mins. Sunday frequency of 30mins improved to 15mins. Route 39/A (24th March 2019): From every 20mins late evenings to every 15mins on Route 39A. Saturday daytime from every 15mins to 12mins. Sunday frequency from 20mins to 15mins. Route 40E (2nd December 2018): New route from Broombridge Station to Tyrellstown. Route 41/A/B/C/D (2nd December 2018): More running time principally. New Route 41D to signify buses to Swords Business Park, Route 41A withdrawn as morning 41Cs serve Swords Manor and Glen Ellan. Route 54A (20th January 2019): A few extra departures Monday-Friday but a significant increase in running time to improve reliability. Route 66/A/B/D/E (: New Route 66E from Merrion Square to Maynooth via Glen Easton running daytime Monday-Friday. Earlier services on 66/A/B. Significant increase in Sunday services, Route 66 from 60mins to every 30mins and Route 66B with a Sunday service for the first time. Route 70 (24th March 2019): Route 70 Saturday 7 new departures with earlier start times. On Sunday frequency doubled (120mins to 60mins) eith earlier start times. Route 83/A (2nd December 2018): Saturday evenings from 30mins to 20mins. Sunday from 20mins to every 15mins daytime, 30mins to every 20mins in late evenings. Route 84/A (21st October 2018): These services got more running time improving reliability. A few weeks later they also were assigned a new universal during term time. 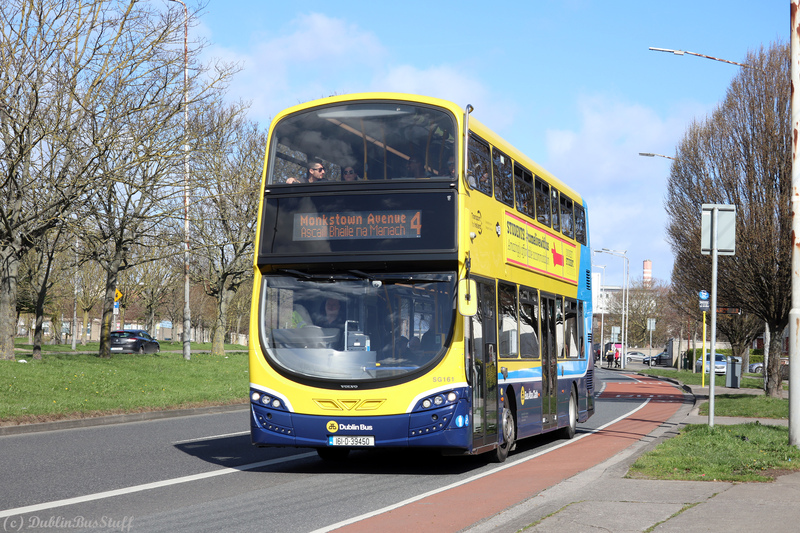 Route 155 (24th March 2019): New route from Ikea to Bray Station via City Centre, operating every 20mins 7-days a week. 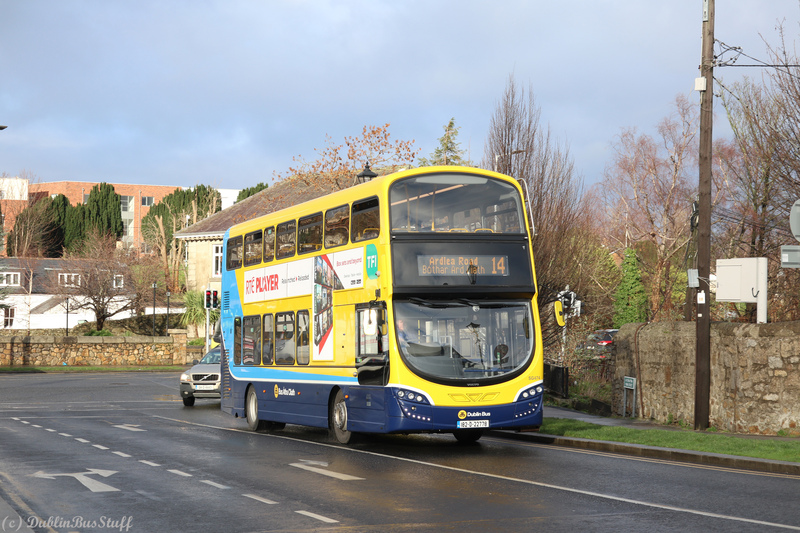 Donnybrook's SG474 is seen heading onto Dundrum Main Street on Route 14 on the 18th January 2019. Route 14 saw significant frequency improvements recently (click on photo for larger version). The following graphs outline the changes to Dublin Bus operations. These show the number of buses (vertical axis) tracking on the RPTI versus time (horizontal axis) on two dates 6 months apart, one just before Go-Ahead began to take over services from Dublin Bus, and one when the process was complete. What they show is slightly more daytime buses Monday-Friday, with a more significant increase in late departures. 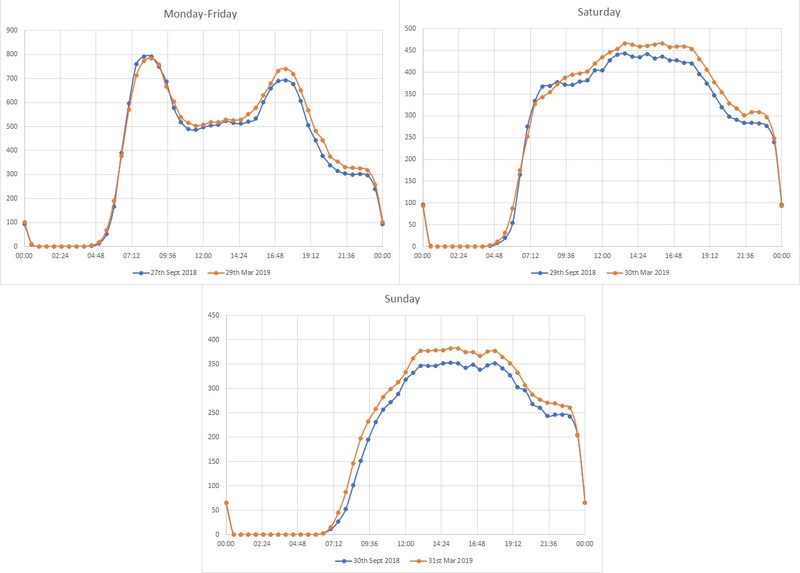 Daytime Saturday services have increased significantly also, but Sunday shows the biggest change in daytime, with an earlier morning ramp in frequency also a trend. The loadings of early Sunday morning buses is incredible, so long may this continue. This change in departure patterns was covered recently in Dublin's first transport orientated pod cast, created by Pat Gill from 98FM. In the first two episodes, Pat discusses the recent changes with both Dublin Bus and the NTA, as well as other equally interesting topics. You can find Pat's podcast here. It's well worth a listen! Recent changes in departure patterns of Dublin Bus services.